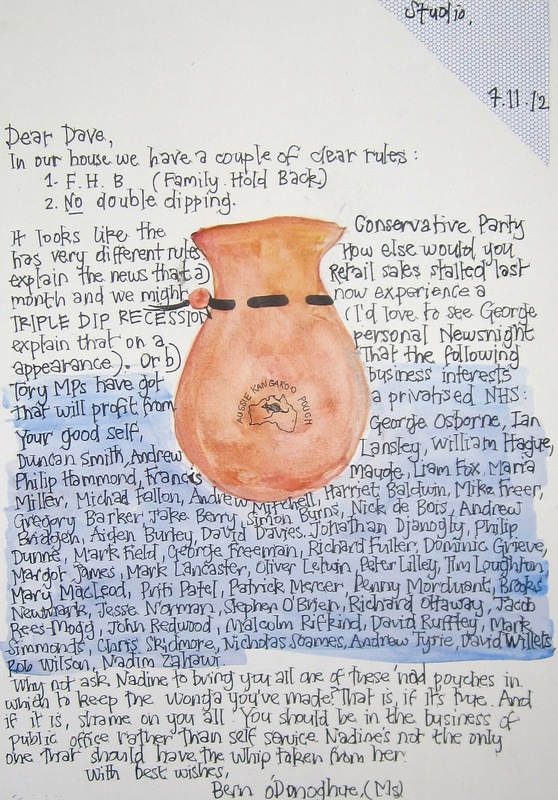 Dear Dave and Nick...: Letter 88: Do Tory politicians serve themselves before serving the electorate? 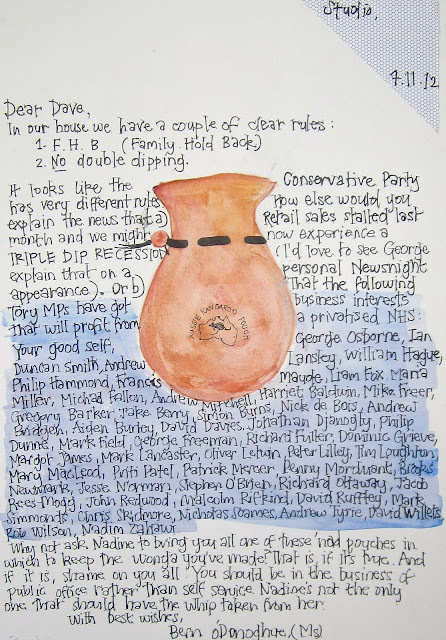 Letter 88: Do Tory politicians serve themselves before serving the electorate? a) Retail sales stalled last month and we might now experience a TRIPLE DIP RECESSION (I'd love to see George explain that on a personal Newsnight appearance). Your good self, George Osborne, Ian Duncan Smith, Andrew Lansley, William Hague, Philip Hammond, Francis Maude, Liam Fox, Maria Miller, Michael Fallon, Andrew Mitchell, Harriet Baldwin, Mike Freer, Gregory Barker, Jake Berry, Simon Burns, Nick de Bois, Andrew Bridgen, Aiden Burley, David Davies, Jonathan Djanogly, Philip Dunne, Mark Field, George Freeman, Richard Fuller, Dominic Grieve, Margot James, Mark Lancaster, Oliver Letwin, Peter Lilley, Tim Loughton, Mary MacLeod, Priti Patel, Patrick Mercer, Penny Morduant, Brooks Newmark, Jesse Norman, Stephen O'Brien, Richard Ottaway, Jacob Rees-Mogg, John Redwood, Malcolm Rifkind, David Ruffley, Mark Simmonds, Chris Skidmore, Nicholas Soames, Andrew Tyrie, David Willets, Rob Wilson, Nadim Zahawi. Why not ask Nadine to bring you all one of these 'nad pouches in which to keep the wonga you've made? That is, if it's true. And if it is, shame on you all. You should be in the business of public office rather than self service. Nadine's not the only one that should have the Whip taken from her.